These Microwave Pizza Potatoes are seasoned with butter, Italian seasoning and garlic salt and cooked in minutes in the microwave. 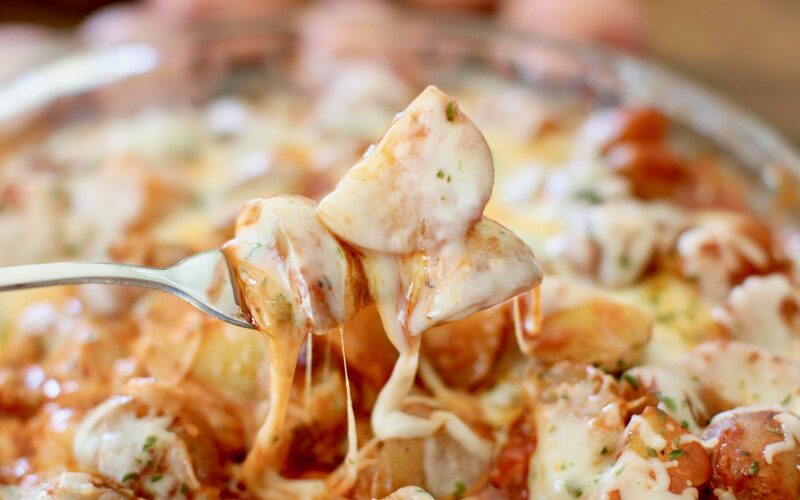 The potatoes are then topped with pizza sauce and shredded mozzarella cheese! Easy and yummy! Dice Little potatoes into one-inch pieces. Place them into a shallow microwaveable bowl or pie plate. Slice butter and place on top of potatoes. Cover plate with microwave-safe plastic wrap and poke a couple of holes in it. Place in the microwave and cook for five minutes. Remove potatoes from the microwave and carefully remove the plastic wrap (careful – there will be hot steam!) and stir the potatoes well. Make sure the potatoes are fork-tender. If not, put them back into the microwave for an additional 2 to 3 minutes. Stir in pizza sauce with the cooked potatoes. Put the plate (uncovered) back into the microwave for about 2 to 3 minutes, until cheese is completely melted.